One of the most mild chilies, the poblano pepper is the most popular chile in Mexico and a great starter chile for people looking to experience some heat without being overpowered. It only has around 1,000 to 2,000 Scoville heat units, compared to 5,000 to 8,000 for the jalapeno pepper or 150,000+ for the habanero pepper. The poblano pepper adds a ton of fruity flavor to dishes, making it a common chile used in conjunction with hotter peppers such as the habanero pepper or cayenne pepper to round out the flavors. 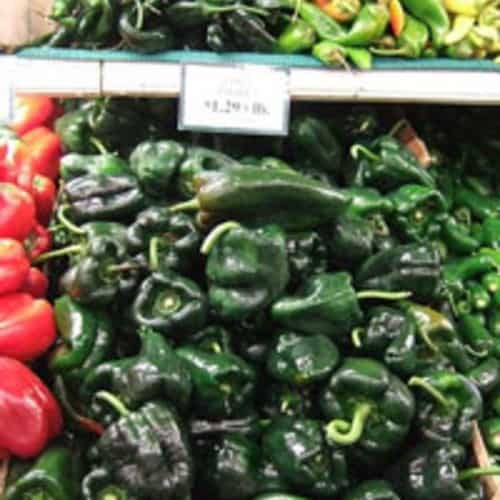 Poblano peppers resemble elongated green bell peppers more than other chile peppers. They are two to three inches wide and about four to six inches long. Immature poblanos are a bright green which turns to dark green and even dark red when the fruit is ripe. When dried, poblano peppers become ancho peppers. Explore more of the world of poblano peppers and you will be able to wow your friends with homemade sauces, fresh habanero salsas and other flavorful recipes. One of the most popular ways to prepare poblano peppers is to stuff them. The mild flesh of the poblano helps to accentuate the stuffing without overpowering it.